MainAll NewsInside IsraelBennett: Who Needs Haifa U's Honorary Doctorate? Bennett: Who Needs Haifa U's Honorary Doctorate? Economy Minister unfazed over Haifa University's refusal to give Prof. Aumann an honorary doctorate. "We'll get over it." 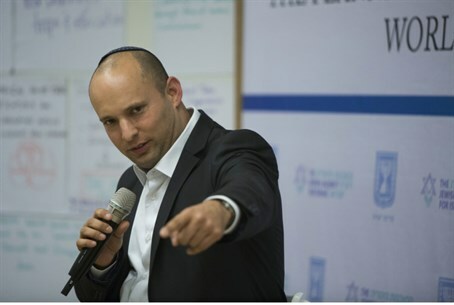 Economy Minister Naftali Bennett (Jewish Home) was unfazed on Saturday night over Haifa University’s decision to refuse to award an honorary doctorate to Nobel Prize Laureate Professor Yisrael (Robert) Aumann due to his pro-Israel politics. Professor Aumann won the Nobel Memorial Prize for Economics in 2005 for his work on conflict and cooperation through game theory analysis. However, despite his intellectual prowess the University has decided to reject the Professor for political reasons. At a hearing to discuss the candidacy last week, the director, Ami Ayalon, agreed with other board members not to award the title, citing concerns that "the Professor's politics are not in line with the University's values." Among the board's concerns were remarks by Aumann in 2010 stating that "the most sensible solution" to the Israeli-Arab conflict is "a Jewish state and an Arab state, where the Jewish state is settled by Jews and the Arab state is settled by Arabs." Referring to Haifa University’s decision on his Facebook page, Bennett compared the university to a minor league in basketball. “Haifa University’s refusal to grant an honorary degree to Nobel Prize Laureate Prof. Aumann for his right-wing views is like a minor league in Alaska choosing not to grant an honorary degree in basketball to Michael Jordan,” he wrote. “We’ll get over it,” declared Bennett. The decision has angered several MKs, such as Shimon Ohayon (Likud Beytenu) who demanded an urgent discussion both at the Knesset plenum and in the Knesset’s Education Committee. Ohayon told Arutz Sheva that it was unacceptable that a university would make decisions based on political positions. MK Ayelet Shaked of Bennett’s own Jewish Home party has sent a letter to Ayalon and to Minister of Education Shai Piron (Yesh Atid), appealing the controversial decision. Shaked pointed out both that Aumann's political views should not be a factor in his academic standing and that other factors in his favor were not taken into account during the review. "How can the board refuse to grant the Professor his honorary doctorate when he has been given international legitimacy by receiving a Nobel Prize?," Shaked stated. "Why, specifically, must his home [Israel] give him a shameful dismissal when hundreds of universities around the world gladly open their doors to Professor Aumann?"